View from the Gatehouse: That's the way to do it! 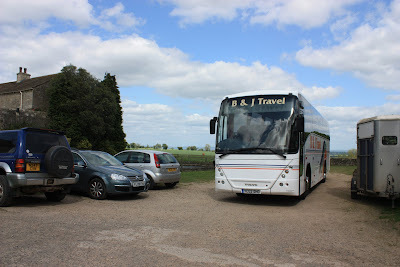 Parking at Markenfield is always a thorny issue - but it is perfectly possible with a bit of common sense and some expert manoeuvring, as this coach from Lancashire shows. One of the first questions we are always asked when it comes to groups (and sometimes even weddings) is "will a coach fit up the drive?". The answer is yes, it will. The Farm has a lot of big machinery that makes its way up and down the drive each day, added to that the number of articulated lorries that visit either dropping off or picking up making the drive quite a busy place at times. They never cause a problem - it just goes to show that large vehicles will - and do - fit.